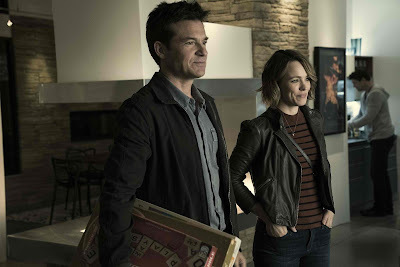 In Warner Bros. and New Line Cinema's Game Night, an action comedy with wild adventures, Max (Jason Bateman) and his wife, Annie (Rachel McAdams), and their four friends, are all set for a murder mystery party, courtesy of Max’s brother, Brooks (Kyle Chandler). Always looking to one-up his little bro, Brooks has promised the avid small-time gamers an epic night, far beyond their usual menu of charades, trivia and Pictionary. So, minutes later, when armed thugs break down the door and drag him away, bound and gagged, his guests are duly impressed by how realistic the fight seemed, how terrified Brooks had looked, and how menacing his assailants were. They can hardly believe it was all staged. Maybe that’s because it wasn’t. Or was it? Sharp, fast and unpredictable, Game Night is a full-on comedy with a fresh approach: shot like an action thriller from the first punch to the last reveal, it aims to keep audiences not only laughing…but guessing. “Some of our favorite films are ones that blend multiple genres, so that audiences go from a laugh to a gasp in a single scene,” says Jonathan Goldstein, who directed Game Night in tandem with longtime creative collaborator John Francis Daley. In Philippine cinemas March 14, Game Night is a New Line Cinema presentation and distributed in the Philippines by Warner Bros. Pictures, a Warner Bros. Entertainment company.